Over the few days I have had a bunch of people tell me that it is just too hard for them to eat healthy and include SO many “greens” in their meals, diets, and lifestyles. It is always easy to make excuses when you are being challenged with making a change…or as Ringo Starr sang, “It Don’t Come Easy”. Making dietary changes doesn’t have to be as hard as we think. Now you can have your “salad on the go”. What is a “salad on the go”? Supreme Greens. 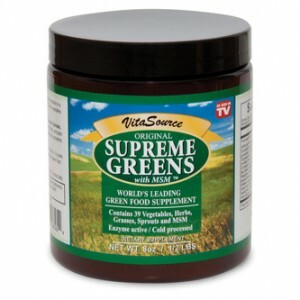 Supreme Greens contains 39 Vegetables, Herbs, Grasses, Sprouts, and MSM. By mixing one teaspoon of Supreme Greens into 16 ounces of water you are helping moving your body, health, and diet up the scale towards alkalinity and away from acidity.